It was nice seeing so many of you at State Session. My thanks to all who entered the contests this past year. Whether or not you took a prize you were the winner. Your Grange was a winner too. 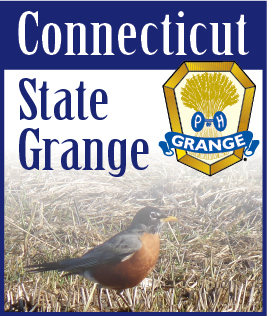 Everyone who participates is important to the Grange. Let’s lead by example and encourage more members to participate next year. HONOR LECTURER AWARDS went to D. Emily Alexander, No. Haven Grange; Joanne Cipriano, Beacon Valley Grange; Susan Pianka, No. Stonington Community Grange; Lois Evankow, Lyme Grange; Marge Bernhardt, Cheshire Grange; and, Debbie Barnes, Stonington Grange. These Lecturers went above and beyond to lead their Granges and need to be congratulated by their members. There were thirty LECTURER’S APPRICIATION AWARDS presented this year. Ask your Lecturer if she received one. If they received the award, please thank them for serving your Grange. If they didn’t get one, ask them what you can do to help them this coming year. We elect our Lecturer, but they can’t do it alone. “SHOULD AULD ACQUAINTANCE” AWARDS were presented to the following Granges: Cheshire, Glastonbury, North Haven, Colchester, Taghhannuck, Beacon Valley, Killingly, No. Stonington Community, Lyme. Old Lyme. A WORD FROM HOME AWARDS were received by: Cheshire, North Haven, Colchester, Hillstown, Ekonk Community, Beacon Valley, Killingly, No. Stonington Community, Prospect, Lyme, Enfield, Stonington, Riverton, and, Hemlock. Now is the time to get started on next years contests and projects. The Lecturers’ Newsletter going out on Nov. 1st will include a list of all our contests and projects for 2012. Good Luck.